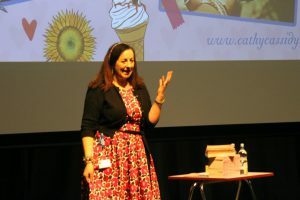 We had a brilliant day as we were treated to a visit by the incredibly popular children’s author Cathy Cassidy, who thrilled the young audience of our own girls plus lots of children from visiting schools. Cathy has written lots and lots of children’s books and our Year 5, 6, 7 and 8 girls looked like they had read pretty much all of them! On the stage in our wonderful new performing arts centre the space, Cathy told the children how she liked to daydream (without getting into trouble!) and how this can fuel the imagination. 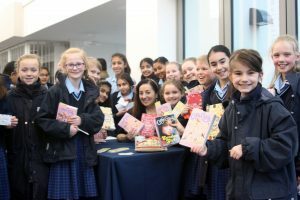 The girls asked her lots of questions about how she got into writing, what were her favourite books, and what were her inspirations, and she had some very funny stories to tell! It was a fabulous morning. The girls were a well-behaved and very attentive audience. Cathy was so interesting, inspiring and encouraging, and the girls loved meeting her and experiencing her warmth and friendship. We’re very grateful to Cathy for coming to see us, and to Mrs Broomfield from the Library for arranging everything.